I am using MacOSX Snow Leopard. How do I achieve page-up and page-down? If you have a full keyboard you can use the pgup and pgdown keys on your keyboard, near the numpad. If you are not using a full keyboard, function, labeled fn on your keyboard, plus the up and down arrow keys will give you a page up and down. So these "keys" fully exist already. This is apparent if you run Linux/Windows natively on your Mac. However, macOS applications are responsible for handling these functions as they see fit, which is not something most of us expect. And the macOS Terminal application needs some tweaking to use them as we all expect. I tend to get this entered by copying a similar entry that already exists, then using the 'delete a character' button, I remove the different bits before typing in the rest. This meets all my expectations for how this should work. It works in vim and through ssh. On my (Danish) keyboard layout (under 10.7.5) it is fn + shift + ↑/↓. It's ⌥ + Up/Down arrow keys. 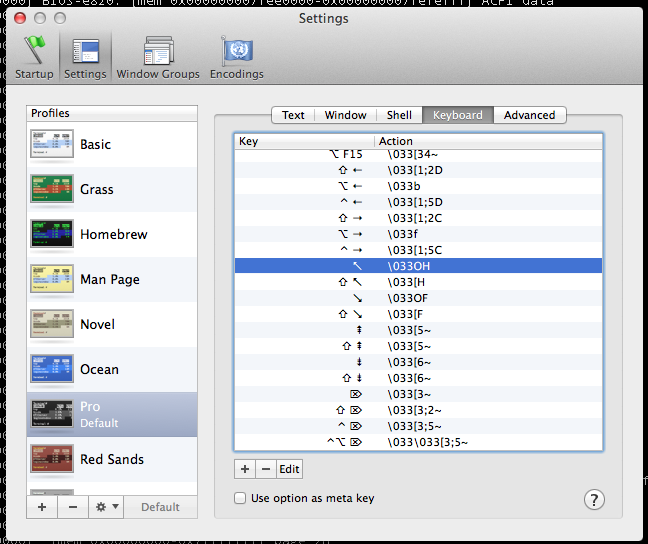 If you use KeyRemap4Macbook app, check under "Change Arrrow Up/Down/Left/Right" keys. When you have this set up, Page Up and Page Down will work with irrsi – I log-on remotely to another linux host for that – you only need to press Shift + Page Up or Page Down will work for that window (as opposed to scrolling pages of OS X terminal window). Successfully tested on my brand new MBPro retina ! Not the answer you're looking for? Browse other questions tagged macos macbook mac . PageUp and PageDown keys for Irssi (IRC) in Macbook? Is there a way to hibernate in mac? How can i diagnose a failed Install of Snow Leopard? How can I play music from my computer through my iPhone 5? Where can I purchase Mavericks? Page up/down with smooth scrolling?